Reflexology is a natural holistic and non-invasive treatment where gentle pressure is applied to the reflexes on your feet. This treatment promotes relaxation, improves your mood, helps you sleep, relieves your tension, and gives an improved sense of well-being. The treatment based on the principle that there are areas and points on the feet that map, via the nervous system, to corresponding parts of the body. When pressure is applied to these areas and points, it stimulates the movement of energy along the nerve channels, and helps to restore homeostasis in your whole body. After a Reflexology treatment you should feel calm, relaxed and stress-free. Reflexology helps with stress, anxiety and tension as well as a variety of common conditions, reducing the symptoms and making you feel more comfortable and revitalized. Your first Reflexology appointment will involve a consultation to determine your general health, medical history and lifestyle. This information will allow us to confirm that the treatment is suitable for you. 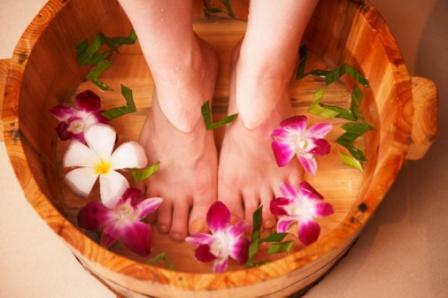 During the Reflexology treatment Dan may detect subtle changes in specific points on the feet, and will work on these points to release any energy blockages to help balance your body. You may experience some sensitivity, which could be due to tension or congestion in the corresponding body area. This is not a concern but an indication that the area needs more attention. Please allow an hour for your first treatment. This will include the time needed to complete a health form and discuss the treatment with Dan. If you have already had a Reflexology treatment with us, please allow 45 minutes. A course of treatments may be recommended to target a specific condition and restore the body's natural balance. Many clients may find it beneficial to continue with regular treatments in order to maintain their health and well-being. What happens after your Reflexology treatment? Experiences with reflexology sessions vary from a general sense of relaxation and rest to a conscious awareness internally of the area of the body where the practitioner is working. Many people experience a tingling sensation in the body, as well as feeling warm, a sense of "energy moving" from the practitioner's pressure to the specific body area or organ. There is often a physical perception of energy flowing through every organ, valve, gland, or muscle, as well as a sense of communication between each body system. When are you available to offer treatments? Please note that this treatment is not carried out by Daniel but by his near namesake Dan. Yes. Dan is fully insured. Yes. When you arrive for your initial assessment we will ask you to fill out a short questionnaire about your health. All your personal details will remain completely confidential. None of your details will be passed to a third party. You can pay in cash, BACS (online banking), PayPal or most major credit and debit cards. If you cancel your appointment within 24 hours, the full fee is still payable. If you cancel with more than 24 hours' notice, we are happy to re-schedule your appointment. Can I book an appointment for today? Yes as long as Dan is available and has free time. What happens if I am early or late for my appointment? Please do your best to arrive on time but if you are a few minutes early or late for your appointment, don’t worry. If you are early, we have a waiting area with magazines and free Wi-Fi. You can see full details of our location - between Woking and West Byfleet in Surrey - and how to get there on our Location Page. Please either park in the drive or directly outside the house if possible. Please do not park outside No 11. You can email us through the Contact Page or you can call on 01483 779997 or text on 07902 716499. You should get a fairly swift response between 8am and 10pm.